Ilya Kovalchuk signed a one-year contract to remain with SKA St. Petersburg of the Kontinental Hockey League on Sunday and said representing Russia in the Olympic Games was a key factor in his decision. If Kovalchuk had returned to the NHL for the 2017-18 season, he wouldn’t have been able to play in the 2018 PyeongChang Games. The NHL announced its decision in April not to participate in next year’s Olympics; the majority of its clubs were opposed to taking a break during the regular season to allow players to compete in the Games. “One of the main factors was the upcoming Olympic Games. In 2018, only players who play in European championships and the KHL can compete there,” Kovalchuk told the team’s website. Kovalchuk has represented Russia at four Winter Olympics, nine world championships, one world junior championship and the 2004 World Cup. Kovalchuk, 34, said he is also looking forward to helping SKA St. Petersburg defend its KHL championship, a feat that will be made more difficult when players also are focused on representing their countries in the Olympics. “The team has the task of defending the championship, and that’s always difficult to achieve. It’s an Olympic year, so everyone who wants to represent their country has to play at their best. I am not an exception, and it’s a challenge which I accept,” he said. 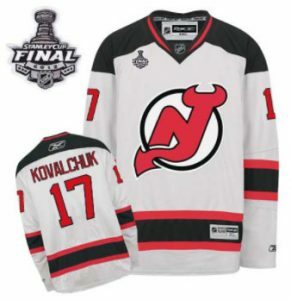 Kovalchuk retired from the cheap NHL jerseys in July 2013 — just three years into his 15-year, $100 million contract with the New Jersey Devils — to play in his native Russia. He is on the NHL’s voluntary retirement list, meaning he could only sign with the Devils. Kovalchuk’s agent, Jay Grossman, announced last week that his client wouldn’t be returning to the NHL for the 2017-18 season after earlier telling Devils general manager Ray Shero that Kovalchuk was open to rejoining the NHL. The Devils had been shopping him in trade talks, which ultimately were unsuccessful. In 245 career KHL games, Kovalchuk has 107 goals — including 32 for SKA St. Petersburg last season — and 157 assists. He scored 417 goals with 399 assists in 816 NHL regular-season games. The Dallas Stars have re-signed young center Radek Faksa to a three-year, $6.6 million contract. Faksa, 23, is coming off his first full NHL season, when he had 12 goals and 21 assists in 80 games. He was drafted 13th overall by the Stars in 2012. He has played in 125 regular-season games and 13 playoff games over the past two seasons. When announcing the deal Monday, general manager Jim Nill said Faksa has proven his value at both ends of the ice and the Stars fully expect him to only get better. Faksa has competed internationally for the Czech Republic at the 2016 World Championships and the 2016 World Cup of Hockey. Forward Tyler Johnson has re-signed with the Tampa Bay Lightning on a seven-year contract worth $35 million, general manager Steve Yzerman said Monday in a news release. Johnson, 26, is coming off a season in which he had 19 goals and 45 points in 66 games, which tied for third in goals on the team and fifth in points during his fifth season with Tampa Bay. Johnson, an All-Star in 2014-15, also ranked first during the 2015 playoffs with 13 goals and was tied for first with the Chicago Blackhawks’ Patrick Kane for points with 23 as the Lightning reached the Stanley Cup Final.